Brushing A Cunning Horse or Why Fictional Languages Can Never Ring True. About a year or so ago I had an essay to hand in and knowing a friend of mine was good with language I asked him to give it a proof reading for me. The essay came back a few days later with the expected kind of corrections; a few sentences that needed to be rearranged for clarity, and some spelling errors that weren’t picked up by Word, like my having mistakenly written “curry” when I meant “carry”. Except I didn’t mean “carry”. The thing about the friend I selected for this task is that although he is a hugely skilled man of words (he has a PHD in English Literature) he isn’t a native speaker, he’s Flemish. The particular turn of phrase “curry favour” that I had used was simply one he hadn’t come across before and is one of just a handful of contexts in which the word “curry” doesn’t refer to foodstuff. So what does it refer to, and what has this got to do with fictional languages? 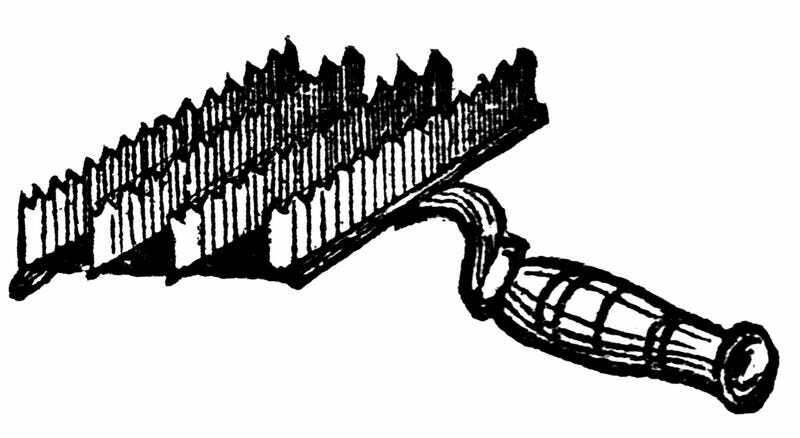 The “curry” of the phrase refers to a curry comb, a short toothed metal or plastic comb for bushing horses. This isn’t the interesting part of the phrase though, that’s in the other half, the “favour” part, because that shouldn’t be a word at all, but a name – Fauvel. Fauvel (derived from a complicated mix of an acrostic and a French double pun) is the equine protagonist of a 14th century poem who, although cunning, is easily won over by gifting, pampering or flattery. So at the hight of the poems popularity to “curry Fauvel” became a common phrase to mean “gain someone’s affection through flattery or attention”, and as that popularity became obscurity and the phrase spread out to lower less literate social classes, “Fauvel” became “favour”. This is, of course, utterly insane, but it’s also completely true and whilst a rather extreme example, not an at all isolated one. English is littered with common phrases with origins rendered obscure by time, things which reference the wool industry (“on tenterhooks”), falconry (“fed up”) or peasants gathering clay (“pothole”), but used and understood by millions of people without any awareness of these things. Right, yes, fictional languages. It’s safe to say everyone here has read, watched, or played at least one story containing a made-up language. Often times these are just nonsense, or referenced so sparingly that they don’t exist at all outside of a handful of words, but those which are part of very large scale works or an on-going series (or written by literature professors) can find themselves fleshed out into “functioning” languages. Elvish is the grandparent to all of these “conlangs” (constructed languages) and it (being a decades long hobby of Tolkin’s) does include some elements of falsified history within it, having old, new, and regional variations, but the sheer wealth of influence of cultural and political history on a language is simply impossible to manufacture. Even if you nod towards parts of the languages attached fictional culture here and there it won’t be at all comparable to the complexity and downright weirdness of real language. Klingon may be the closest to containing an equivalent to this random influence, as a few parts of the language have their origins in things like mistakes and off the cuff decisions made by actors in various Star Trek films and episodes which have then been incorporated into the language by the show’s legions of fans. Of course where this sense of spontaneous authenticity starts to fail for Klingon is that it is an alien language from a distant region of the galaxy which...still has a closer relationship to English than many Earth bound languages do (like its base ten number system). So what does this mean for conlangs? That they’re pointless and doomed to failure? Well no, they’re good fun and are a great addition to world building fiction, not to mention wonderful community projects for any fans who enjoy playing about with language. What it does show though is just how deeply ingrained language, culture and history are with each other, which is something to think about when putting words into the mouths of characters inhabiting other worlds. Creating a culture with its own distinct language doesn’t have to mean building a whole new grammatical structure from the ground up, simply pay close attention to the origin of the words and phrases you use now (in whichever languages you speak) and you’ll see numerous ways in which it can feel as other worldly as any combination of completely made up sounds and squiggles. Like inventing a strange land in the north where people speak in a language that refers back to ancient poems that none of them recall. The origin of some of the phrases appearing in this article. “ring true” comes from the practice of dropping coins onto a stone surface and judging the quality of metal by the sound they made. “turn of phrase” has a complicated origin and “turn” likely refers to the same process as “turning” wood, thus relates to a craft being skilfully executed. “off the cuff” may be a reference to the short lived fashion for disposable paper collars and cuffs, on which some clerks, journalists and writers would make notes. Some resources used for this article.